What: Shares of Glu Mobile (NASDAQ:GLUU) powered up 35% in April, according to S&P Capital IQ data, as investors reacted favorably to the company's first-quarter earnings report, a strategic relationship with Asian gaming company Tencent, and an exclusive mobile-gaming partnership with pop icon Britney Spears. So what: In a late-month surprise, the company's earnings report provided the majority of gains. From a revenue standpoint, the company reported GAAP revenue of $69.5 million in Q1 2015, good for a 55.8% year-over-year increase over last year's $44.6 million. On an earnings-per-share basis, the company reported $0.01 versus last year's break-even figure. CEO Niccolo de Masi commented on this quarter's results: "The outperformance during the first quarter was driven by the ongoing traction of Kim Kardashian: Hollywood, Racing Rivals, Deer Hunter 2014, and Contract Killer: Sniper." Apparently, the company is following what works by partnering with celebrities Katy Perry for a 2015 game release and the recently announced partnership with Britney Spears, expected to result in a game in the first half of 2016. Now what: However, the biggest news of the quarter was the strategic partnership with Chinese-gaming company Tencent Holdings. All told, the company is buying 14.6% of Glu Mobile at a price of $6 per share to further expand into the U.S. gaming market, as Tencent already owns a minority stake in Activision Blizzard and appears to be expanding more aggressively into the U.S. mobile gaming space with this purchase. Most notably, Glu Mobile increased full-year non-GAAP revenue guidance to a range of $262 million to $287 million, up from a range of $245 million to $275 million. 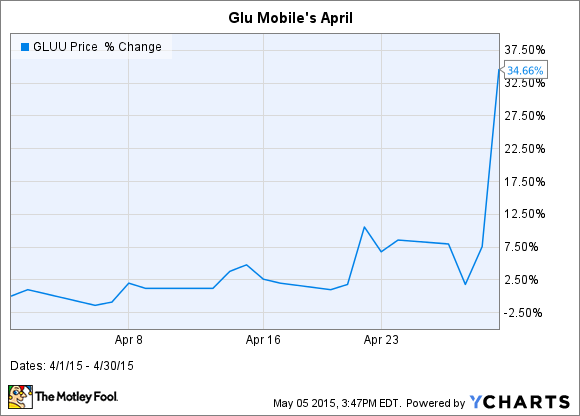 In all, it was a great month for Glu's investors. That said, mobile gaming is a hard business for long-term sustainable value, requiring a constant stream of new hit games or the rare long-tailed hit game. Although Glu Mobile has fared better than competitors Zynga and King Digital, mobile gaming is an inherently tough business. Therefore, I'm willing to watch Glu Mobile's moves from the sidelines.